Vetho Apartments Hotel is centrally located in the hub of Kempton Park, less than 10 minutes’ drive from OR Tambo International Airport. 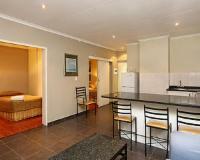 Accommodation is provided in stylish and modern apartments, all fully fitted for self-catering. Guests can choose to stay in one of the Studio one-bedroom apartments or the Double Room apartments. Each apartment offers a fully fitted kitchenette and en-suite bathrooms. All the bedrooms are fitted with air-conditioning and TVs with DStv. Bedding and bath towels are provided. the rooms are spacious and clean. Vetho Apartments Hotel is 5.1km from the centre of Kempton Park , the nearest airport 3.5km (Johannesburg International Airport).